You might think for a minute that I really meant to write “sight”, however when you are in charge of the care and maintenance of a large portfolio of small facilities, the word “site” fits, and the expression can be quite literal. Many customers pondering the benefits of energy management will tell me they have programmable thermostats as a first line of defense in keeping store temperatures in check. However, when I have the opportunity to visit a location, I often see a thermostat that is easily accessible by anyone, and often, not on a programmed schedule at all. Recently while surveying a location with a customer, I took a look at a programmable thermostat in a plastic lockbox. 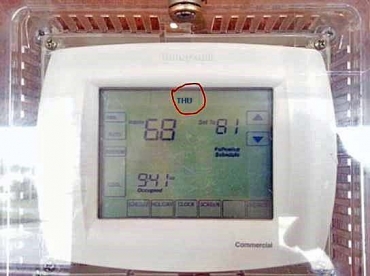 You know, the kind that are supposed to read the temperature, yet prevent anyone from making changes. First, the lock was still there. Unfortunately, it did not work: anyone could walk by and open the box. That was problem number one. Second, I noticed the day of the week was showing as Thursday. It was actually Wednesday! This was a location that has very different weekend hours, so you can imagine the difficulties this would cause with trying to heat and cool the building at the wrong hours. Think of all the dollars wasted in energy costs. Sadly, this is an all too common occurrence. Even if your HVAC contractor performs PM’s twice a year, during the remaining 363 days when you think everything is fine, often it’s really not. Enterprise level HVAC controls can solve this common issue by providing exception reporting that will alert you to thermostats that have deviated from their schedules, and allow you to consistently push the correct schedule to sites en masse. Add HVAC monitoring with temp sensors, and you have a very effective way to control temperatures, lower your energy bills, and save on Repair & Maintenance costs. Just ask our SiteSage customers, they’ll tell you.